Ten-year-old Jewel may seem like a happy dog now, but her past was anything but that. In 2009, she was seized from a house in northern Florida by Nassau Humane Society animal control officers. The poor dog was in horrible shape. She was extremely skinny and malnourished, and had sores and cigarette burns all over her body. Someone had also cut her ears off with a scissor. By her appearance, and the way she cowered when people went near her, it was obvious that she had been previously abused. She was rushed to a vet where she was diagnosed with heartworm disease and treated accordingly. Aside from trying to get healthy, she was also caring for her litter of puppies. The vet believed her former owners used her just to have multiple litters to sell. A woman named Hayley Baer took Jewel in as a foster and eventually adopted her. Despite everything Jewel had been through, she remained in positive spirits and was extremely friendly toward people and even other animals. Especially cats. Jewel loved cats and the cats loved her back. Baer’s cats, Lavender and Lily, whom Jewel first met, initially watched Jewel from a distance. But once they got more comfortable with having her around, they started to get closer to her. Eventually they became friends and were soon cuddling together! Sadly, in 2012, Jewel’s cat friend duo passed away. 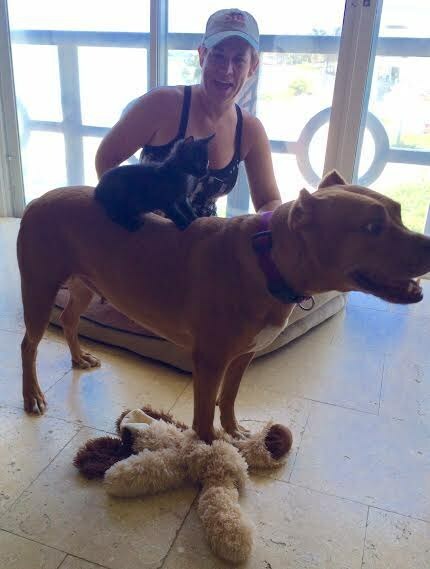 Baer knew how much Jewel loved cats, so she decided to start fostering other kittens. Jewel welcomes in every single cat that comes into their house, and the cats surprising respond with the same warm reaction. It’s safe to say that Jewel is a cat whisperer! Later in 2012, Baer started fostering two street kittens who had been living under a porch. The cats, named Anderson and Cooper, also formed a strong bond with Jewel. When it was time for the kitties to go to a new home, Baer knew she had to adopt them. All these years later, the three of them are still the best of friends! They enjoy playing together, snuggling, and are absolutely inseparable. Baer says that they are more of Jewel’s cats than they are hers. It’s so heartwarming to see animals of different species getting along and loving each other unconditionally!